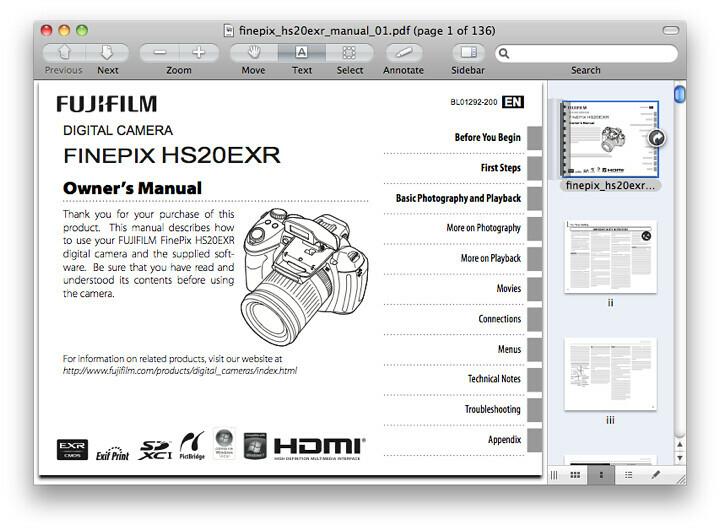 The English Language Fujifilm FinePix F550EXR user manual / operating instructions (FujiFilm calls it the “FujiFilm FinePix F550EXR Digital Camera Owner’s Manual”) is now online and available for download at FujiFilmUSA.com (right-click and save the user guide to your hard drive). If the download link didn’t work for you, go to the Support & Contact Center page for the F550EXR and manually locate the file finepix_f500exrseries_manual_01.pdf. Unlike with Nikon, Fuji allows you to freely print the F550 EXR owner’s handbook without building in any password protection into the PDF. The file size of 151-page Fuji F550EXR Adobe Acrobat PDF document is 2.3 MB (megabytes). The guide discusses the features of the FinePix F550EXR and how to use the camera. Pages 58 to 60 has instructions on recording GPS data with pictures. Pages 27 through 29: Proper insertion and removal of SD, SDHC or the latest SDXC memory cards. Page 84: You’ll need a cable with a HDMI Mini connector on the end that connects to the F550EXR in order to view high-quality movies and photos from the camera on HDTV sets. Page 125: The table on this page lists several optional FUJIFILM-branded accessories, namely, AC power adapter AC-5VX and DC coupler CP-50. Popular Fuji F550 EXR books and other printed literature and reading material in the Arts & Photography and Books section on Amazon.com. Visit Fuji 550 EXR for reviews, tips, tricks, techniques, resources and other helpful information.